Turn the FEEDBACK control up and activate LOOP, PLAY, and REC controls. The position of the LOOP sliders will determine the length of your delay. Note that the loop sliders have a limited resolution, as they must traverse a great deal of memory. Great care has been taken to provide a click-free delay effect in this mode, but should you require a finer loop resolution you must use the TAP TEMPO mode in this delay configuration instead. 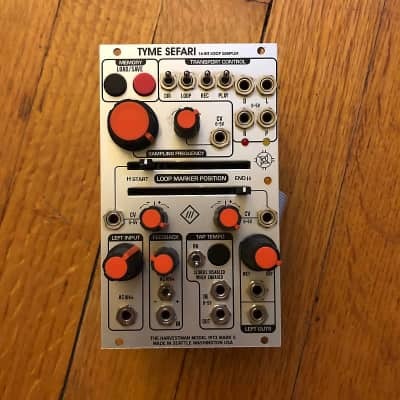 The SOUND OF THUNDER adds several optional modes to the Tyme Sefari, activated through 8 sets of toggle switches and gate inputs. Like the Tyme Sefari, the parameter is active if the switch OR the gate input is high. The gate inputs are provided to automate control of this module's deep functions, and to present further sound design possibilities. For example, the stereo and format controls change the way that audio data is encoded AND decoded from memory, but the data in memory is not tagged with its proper format description. If you record in one format, but then playback in another, new, extreme distortion effects may be heard depending on the combination of modes used for recording and playback. 12-bit linear. This is stored into memory with the bytes swapped, and restored to normal when played back. 12-bit logarithmic (Ã‚Âµlaw) - This setting doubles the amount of memory available for recording, and slightly increases the maximum sampling rate. 8-bit linear - This setting doubles the amount of memory available for recording, and slightly increases the maximum sampling rate.